I’m not sure why Lisa D’Amour’s play currently on view in Houston is called Detroit, since I don’t think I heard the troubled Michigan city mentioned once during the 90-minute, no-intermission production. But thanks to a super cast fielded by Catastrophic Theatre, you won’t miss knowing what the title means, says or refers to. The show is funny and entertaining, riveting enough to keep your eyes from wandering, and at least a little thought-provoking after the non-curtain has gone non-down. D’Amour takes us into two backyards in someplace that, of course, might be Detroit – there is a definite sense of economic hard times but, I think, more like the hard times suffered almost everywhere during the Recession rather than in a city with lasting financial woes and bankruptcy lurking at every turn. These financial troubles serve as a kind of metaphor for lives lived in “quiet desperation,” until the desperation gets loud (and X-rated) indeed. This is, obviously, some effort to show the dark side of the American Dream, since much of the content involves houses, furniture, backyards, lawns, decks and barbecue pits. These people should be happy, we’d be tempted to say, watching them laugh and cook and eventually dance in the sunshine – except we sense they’re not. 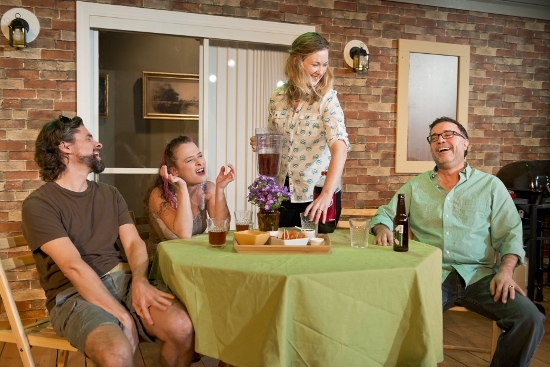 Two couples living next door meet casually, noting that neighbors never meet anymore. Mary (played by Mischa Hutchings) and Ben (Jeff Miller) look more normal, though maybe a tad too all-American in their smiles and alcohol consumption, with her working a real job so the recently laid-off Ben can start a home-based financial business that requires nothing more than a presence on the Internet. Sara Jo Dunstan and George Parker play a stranger – and more strangely lovable – couple, though they reveal they’re actually squatting in an empty house owned by a relative because they just got out of drug rehab, where they either did or didn’t first meet. We sense shadows haunting each couple, not to mention each of the four as individuals. Things are not at all what they seem, even as much of the time in the play is spent having fun, concocting short- or long-term schemes, and dreaming dreams. An old relative (evocatively played by Jim Tommaney) turns up near the end, after the disaster, to remind Mary and Ben how nice the neighborhood used to be – and probably, by suggestion, how nice human existence used to be, though we, as usual, don’t know when. This is not a new narrative or a new message – I think of American short stories by Sherwood Anderson, F. Scott Fitzgerald and others from the 1920s (before the Crash), and of course Death of a Salesman and other Arthur Miller plays, in which we watch a decent guy naïve enough to believe the promises America has made him slowly stripped of his last illusion. Here, however, there is nothing so certain or doctrinaire, nothing so Greek. Thanks to spirited direction by Troy Schulze and evocative design by Kevin Holden, what we have is a wild and wildly entertaining ride that just might haunt the corners of our minds the next time we think things are going so well. The Houston Symphony kicked off its 2014-2015 season at Jones Hall with a special opening night gala and concert led by the organization’s fifteenth music director, Andrés Orozco-Estrada. Columbian-born and Vienna-trained, Orozco-Estrada is one of the most sought-after conductors of his generation. 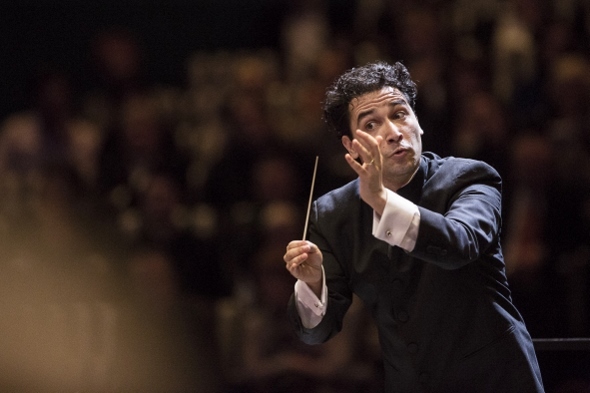 Born in Medellín in 1977, he is also the first Hispanic music director the Symphony has ever had. Pronounced to rhyme with “undress” (insert audience giggles here), Andrés is very passionate about his work. His first conducting lessons were at the ripe old age of 15. By the time he was 19, he had moved to Vienna to continue studies at the renowned Vienna Music Academy. In interviews, Andrés praises the Germanic culture for teaching him precision, respect of the musical score, and structure. This year’s opening concert featured the award-winning and extremely talented British trumpeter, Alison Balsom. She studied trumpet at the Paris Conservatory, and with Håkan Hardenberger. Alison has performed all over the world with some of the greatest conductors and orchestras. Alison was most recently named 2013’s Gramophone Artist of the Year, is a three-time winner at the ECHO Klassik Awards and also a three-time winner at the Classic BRIT Awards. The official start of this inaugural season was nothing short of unexpected. The first piece of music in which he led the orchestra was our very own national anthem. While the audience stood and applauded his arrival on stage, he motioned to the audience to remain standing, proceeded to turn around with his chest held high, and The Star Spangled Banner begun to play. A sound of surprise and delight went through the audience, and everyone begun to sing. Once the audience had quieted again, Andrés got down to business. The program opened with Mozart’s Overture to Le Nozze di Figaro (The Marriage of Figaro), K. 492 which always delights. This is where the audience was able to experience the uniqueness that is Orozco-Estrada. He moved in such a way as to try to physically interpret the sounds from the orchestra with his body, like a kind of language, to physically communicate the music to the audience in real time. Everyone really seemed to enjoy the performance for the eyes as well as the ears. Next, featured artist Balsom performed Haydn’s Trumpet Concerto in E-flat major, Hob. Vlle: 1 (I Allegro, II Andante, and III Finale: Allegro). This went over smashingly well. “Bravo!” was heard many times through the roar of the audience. As quickly as Alison and Andrés left after the standing ovation to go backstage, they both came back out and Alison announced that they had suddenly decided to play an encore. With all the musicians onstage joining in, the pair served up a lively Latin piece that had the audience on its feet swaying and coming close to dancing. The spirit of the performance was nothing less than infectious. The program concluded with a great show piece for the orchestra, Maurice Ravel’s orchestral version of Modest Mussorgsky’s famed piano suite Tableaux d’une exposition (Pictures at an Exhibition). For those that wish to know a little background on Mussorgsky’s composition, this suite was inspired by his late friend, Victor Hartmann, an architect and artist, who died suddenly of an aneurysm at the young age of 39. With the sudden shock of losing one of his dearest friends, Mussorgsky composed the famous Promenade and 10 movements in 1874 after attending an exhibition at the Academy of Fine Arts in Saint Petersburg, Russia. The exhibit was organized with more than 400 Hartmann works. Mussorgsky’s music depicts an imaginary tour of an art collection, ten of Hartmann’s drawings and watercolors, a wonderful posthumous tribute to a dear friend. As most of the pictures from the Hartmann exhibit have been lost, it makes it difficult, if not impossible, to be sure which works Mussorgsky had in mind when composing, but this does not deter today’s audiences of the enjoyment of hearing a brilliant suite of music. Andrés masterfully conducted the orchestra through the Promenade and the following ten pieces of music. The show was riveting… everyone on their feet after every performance. What a way to start a season! Andrés’ Inaugural Season will be nothing short of exciting with innovative concert experiences he wishes to share with his now-fellow Houstonians. He believes that the symphony belongs to everybody and plans to make that happen by holding free performances throughout the season, such as the recent performances at Miller Outdoor Theatre. Thanks to ConocoPhillips for their continued decades-long support of the symphony’s Opening Night Concert. If you would like to experience the delight of Andrés Orozco-Estrada and the Houston Symphony, please visit http://www.houstonsymphony.org/ for more information, or call the Houston Symphony at 713-224-4240.